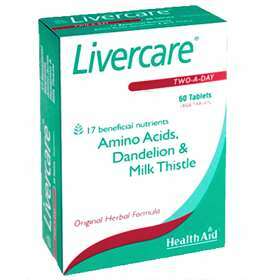 Livercare Two-A-Day tablets provides you with the nutrients needed too keep your liver functioning normally. Modern lifestyle choices can force the liver to work hard; and nutritional support may be beneficial for it to function optimally. Contains Amino Acids, Dandelion and Milk Thistle. Free from yeast, gluten, wheat, soya, starch & dairy. Please read the pack before use. Adults and children over 16 years of age, two tablets daily. Bulking Agent (Di-Calcium Phospate, Microcrystalline Cellulose), Choline Dihydrate Citrate, Inositol, L-Cysteine HCL, L-Glutamine, L-Methionine, Milk Thistle Extract (Silybum Marianum), Curcumin Extract (Curcuma Longa), Dandelion Root (Taraxacum Officinalis), Vitamin B3 (Nicotinamide), Anti-Caking Agent (Veg.Magnesium Stearate, Veg.Stearic Acid). Artichoke Leaf Powder (Cynara Scolymus), Vitamin B5 (Calcium D-Pantothenate), Beta Carotene, Vitamin B6 (Pyridoxine HCL), Vitamin B2 (Riboflavin), Vitamin B1 (Thiamine), Folic Acid, Vitamin B12 (Cyaocobalamin), Binding Agent Polyvinylpyrrolidone (PVP).